Child vaccination remains among the most cost-effective uses of public and aid monies. In a highly contested funding environment where priorities must be set for the allocation of scarce concessional resources, investment in expanding the availability and coverage of cost-effective vaccination must come at the top of the list. Gavi’s mission—saving children’s lives and protecting people’s health by increasing equitable use of vaccines—remains highly relevant. Gavi and its partners have made enormous progress towards increasing equity in the introduction of vaccines; children living in the lowest-income countries now have access to the same set of vaccines as those living in high-income countries. Gavi and partners have also contributed to increased coverage; immunization rates are higher in Burundi and Rwanda, for example, than in many places in the United States and Europe. Yet the effects of under-immunization anywhere can have global implications everywhere, as recent outbreaks illustrate. New or dormant threats are also a new reality—newly vaccine-preventable diseases like Ebola or virulent flu strains can spread swiftly and lethally in an interconnected world. These global realities require a new approach. A country crossing an income threshold does not signal mission accomplished for an organization that aims to save lives and protect health with vaccines. Vaccines can only deliver on their health impact and value-for-money promise if herd immunity is attained and sustained. Gavi 5.0 needs a new model to deliver on its laudable mission. Immunization coverage remains low in too many places. Increasing immunization coverage and equity have been part of Gavi’s mission since its founding. 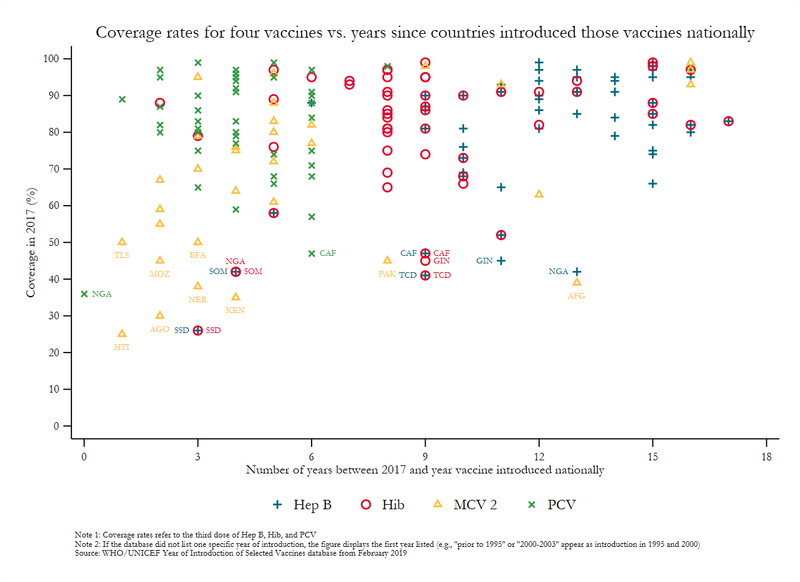 Yet coverage rates of Gavi-funded vaccines are highly variable, particularly among those countries with the largest birth cohorts that are poised to or have already transitioned away from eligibility. In Ethiopia, for example, the pneumococcal conjugate vaccine was introduced in 2011 but coverage of a third dose of PCV among children 12–23 months had only reached half of children as of 2016, and less than 40 percent of children had received all basic vaccinations. Too often, the new vaccines reach the same children that already receive services and actually increase inequities as the same vulnerable populations are missed by more interventions and services. While there are important success stories, there are just as many cases of stagnation and several egregious cases of very low coverage more than a decade after a vaccine is introduced. Drivers of under-immunization vary but are linked in the literature to the distribution and training of health workers, high staff turnover, and salary payment delays; shortfalls in funding created by macroeconomic changes, weak demand forecasting, or lack of budget priority to immunization; procurement and supply chain issues (e.g., global shortages of IPV and high wastage rates); and low demand, in part driven by parental beliefs or economic constraints as well as unfounded fears about vaccine safety and the intent behind immunization efforts, among others. Country eligibility and transition criteria don’t fit with mission and expected results. In its first 20 years, Gavi targeted its support to the 68–77 countries meeting its income-based eligibility criteria over the period—specifically, GNI per capita under or equal to a threshold ($1,580 as of 2018, averaged over a three-year period since 2015). Historically, these countries housed most under-vaccinated children and struggled with the most severe resource constraints, offering a natural target for immunization support. Now, many of the largest recipients of Gavi funds will soon become ineligible for support under current rules; the population of under-vaccinated children will become concentrated within Gavi-ineligible countries; and a wider range of countries will struggle to sustain and expand vaccination financing and coverage amidst rapid urbanization, competing priorities for health spending, growing vaccine hesitancy, and complex emergencies and displacement. Further, there is historical evidence that Gavi-ineligible countries pay much higher procurement prices for many vaccinations (see below); that aid overall drops once the GNI threshold has been crossed and particularly affects the social sectors; and that public expenditure does not increase sufficiently to compensate for these declines. Together, these forces suggest that a more nuanced and less ad hoc approach to transition extensions and modalities is required. Vaccine price, quality, and supply constraints are a problem for the growing number of countries transitioning from or not eligible for Gavi support and make Gavi’s market shaping tools weaker. Gavi non-eligible countries pay high—and highly variable—prices for vaccines, with self-procurers doing significantly worse. Unaffordable vaccine prices not only limit a country’s ability to expand coverage but also deter new introductions. Further, market constraints related to supply and competition—due in part to insufficient production capacity, reliance on a small number of manufacturers, or safety missteps in own-manufacturing—continue to limit access to vaccines, with implications for Gavi and non-Gavi countries alike. Incentives and markets for future vaccines remain ill-defined, despite promising vaccine candidates that could potentially represent large-scale coverage gains such as hexavalent including IPV, universal flu vaccine, or Ebola vaccine. Further, the effectiveness of Gavi’s own market shaping is under threat as current country eligibility rules will dramatically reduce the overall size of its vaccine procurement, potentially constraining its ability to drive lower prices and innovation through regular and predictable large-scale tenders alone. Health system support creates limited incentives for coverage gains and is insufficient and overly complex for implementing partner countries. Gavi’s support to health systems has swung from lesser to greater complexity over the past 10 years, but neither approach has proven clearly effective in solving coverage shortfalls. The current alphabet soup of acronym-denominated approaches and requirements makes it hard for countries (and CGD) to understand the exact offer, and the health systems grants are generally small-scale—less than $5 million per year. HSS and related support finances inputs into the delivery of vaccines—such as refrigerators, motorbikes, and training manuals—or technical assistance support via international agencies. Fully two-thirds of HSS funds are now channeled to partners rather than through country systems (See Nov 2018 board paper 6b). While the 2016 Full Country Evaluations led by IHME made a series of recommendations for reform, it is unclear whether the Gavi Secretariat has made progress in implementation. Likewise, countries do an HSS evaluation at the end of their grant, and several evaluations have been done previously – it is not possible to discern impact on the outcomes that matter from these materials. Delivery in conflict and fragile settings is constrained by Gavi rules. Gavi’s income-based eligibility thresholds are sensible in stable, centrally governed nation-states, where per-capita income serves as an imperfect but useful proxy for the affordability of vaccination using government resources. Yet increasing protracted displacement and migration—sparked by conflicts, complex emergencies, and (increasingly) climate change—challenge this approach, and more low-income country focus means more concentrated money in fragile and conflict settings. Gavi has taken a step toward a more inclusive policy with the Board’s 2017 decision to permit certain operational flexibilities in fragile states, during emergencies, and to assist refugee populations. However, current policies do not permit Gavi support to refugee populations housed in non-eligible countries—where almost half of the world’s 18 million refugees live—regardless of need. Further, even when vaccine delivery through government does not make operational sense, Gavi is obliged to operate through this channel, missing opportunities to increase access and coverage through other partners. The attention to supporting governments in their quest to establish sustainable immunization programs is right, and in some fragile states—like Liberia or South Sudan, where programs can work—this makes sense. However, in other settings, it is unlikely that government will be able to execute and expand coverage in the near or even medium term. Conserve the mission, double down on increases in equitable coverage within countries: Gavi’s mission is more important than ever and many of its activities, such as vaccine procurement and introduction support, remain valuable. But with a changing context, Gavi funding must also contribute to the outcome that is meaningful for health impact: full immunization for age with existing and new cost-effective vaccines in the places where need is greatest, and coverage is lowest. Introduction on its own without equitable coverage is no longer meaningful for the mission. Modernize and build on evidence for vaccine selection, market shaping, and procurement: There are significant cost savings and coverage gains to be made through pooled purchasing and/or framework agreements (negotiated access pricing) for price and quality. As more countries transition, Gavi and partners will need to create incentives and build political will for more economical strategies for procurement by clearly demonstrating potential efficiency gains and, in turn, making the problems of self-procurement and corruption/safety issues more visible in the public domain. Expanding VII’s capital base and clearly articulating VII procurement with Gavi procurement is one option to create stronger incentives for country buy-in. Quality challenges and shortages can also be addressed through a broader set of market shaping tools and strategies. For example, where appropriate, auction and other procurement methods to assure supply security of affordable high-quality products should be tested and used more widely. Advance purchasing or market commitments should also be a regular feature of Gavi given the importance of new vaccines in the pipeline, and an explicit relationship with the vaccine development pipeline, particularly at CEPI, should be established. Reset health system support to create strong and clear incentives for vaccine delivery and coverage with rigorous evaluation: For an organization with limited staff, Gavi should shift from purchasing specific inputs and addressing micro-barriers, and towards reforming policy frameworks and incentives for coverage. Supported interventions should directly address the drivers of under-immunization, including public spend-need mismatches, low demand for immunization, vaccine refusal or hesitancy, health worker shortages, and other major constraints on delivery. Support for interventions that have not been rigorously evaluated or have only limited evidence should hinge on the addition of an independent evaluation. Advocacy and information interventions to address vaccine hesitancy may be one interesting avenue to pursue, for example, or a clearer evaluation of the costs and impact of campaign versus routine immunization, and when to use each strategy. Another option is to support targeted “immunization challenges” to subnational (state or provincial) authorities to increase vaccination coverage in underserved populations, modelled on the successful Nigeria Governor’s Immunization Leadership Challenge, the Polio Debt Buy-Down, or Salud Mesoamerica. As Gavi continues to work on vaccine introduction and consider potential additions to its portfolio (e.g., the hepatitis B birth dose and booster vaccines for DTP), it should also consider testing what strategies may prove useful in minimizing the cost of introducing and routinizing new vaccines as part of health systems support. Add money to deliver on the expanded agenda: In addition to its role as a health and development organization, Gavi should be a substantive and financial part of the humanitarian system and the global health security agenda, and part of global strategies to eliminate polio and to prevent and control influenza. Exact amounts need to be evaluated. Silverman (2018) has estimated that the funds made available from 2018 country transitions was equivalent to about $57 million, or 5 percent of Gavi’s 2017 disbursements. If new middle-income modalities are less expensive, or continued progress is made in co-financing, an additional amount may be released from subsequently transitioning countries. However, our suggestions for an expanded mandate, more important now than ever—including vaccine-preventable disease surveillance, more significant vaccine delivery support/incentives, and market incentives for new cost-effective vaccines—will require additional funding. The exact amounts should be assessed by the Gavi secretariat and partners; but, from an external view, it is apparent that the replenishment should be at least the same or larger than previous iterations. Ozawa S, Clark S, Portnoy A, Grewal S, Brenzel L, Walker D.G. Return on investment from childhood immunization in low- and middle-income countries, 2011-20. Health Affairs. 2016 Feb;35(2): 199–207; Tu HT, Woerdenbag HJ, Kane S, Riewpaiboon A, van Hulst M, Postma MJ. Economic evaluations of hepatitis B vaccination for developing countries. Expert Rev Vaccines. 2009 Jul;8(7):907-20.; Griffiths UK, Miners A. Economic evaluations of Haemophilus influenzae type b vaccine: systematic review of the literature. Expert Review Pharmacoecon Outcomes Res. 2009 Aug;9(4):333-46; Tasslimi A, Nakamura M, Levine O, Knoll M.D, Russell L, Anushua S. Cost-effectiveness of child pneumococcal conjugate vaccination in Gavi-eligible countries. International Health. 2011 Dec;3(4):259-69; Atherly D, Dreibelbis R, Parashar UD, Levin C, Wecker J, Rheingans RD. Rotavirus vaccination: cost-effectiveness and impact on child mortality in developing countries. J Infect Dis. 2009 Nov;200(Supp 1):S28-38; Denny L, de Sanhose S, Mutebi M, Anderson B.O, Kim J. Interventions to close the divide for women with breast and cervical cancer between low-income and middle-income countries and high-income countries. 2016 Nov. S0140-6736(16)31795-0 (published online). An exception to this rule was noted by Gavi where it supported the Central African Republic via MSF for some years after a coup.